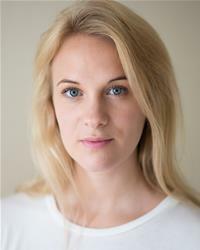 Emma’s Theatre roles include Eleanor/Emily in NORTHANGER ABBEY for Theatre Royal Bury St Edmunds, ‘Soren’ in VIEW FROM HERE at Theatre 503, ‘Romeo’ in ROMEO & JULIET at York Theatre Royal, ‘Bel’ in HONEST at Salisbury and ‘Marie’ in ENDURING SONG at Southwark. On Television: ‘Megan’ in DOCTORS, Young Nancy’ in NEW TRICKS for BBC1, ‘Gwen’ in THE LAST LAUGH for BBC3, and ‘Fleur’ (series lead ) in INTERGALCTIC KITCHEN for CBBC. Emma originated from Edinburgh and is a Mezzo Soprano.